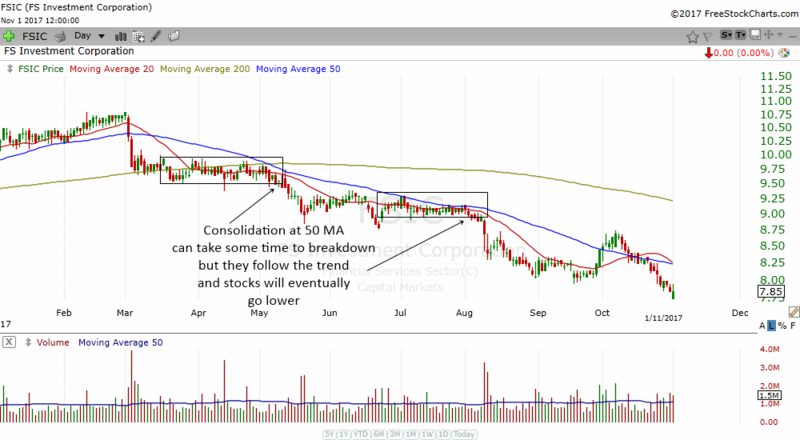 The bearish consolidation at 50 MA chart pattern is another chart pattern that I discovered that often points us to a stubborn stock that will eventually go down. 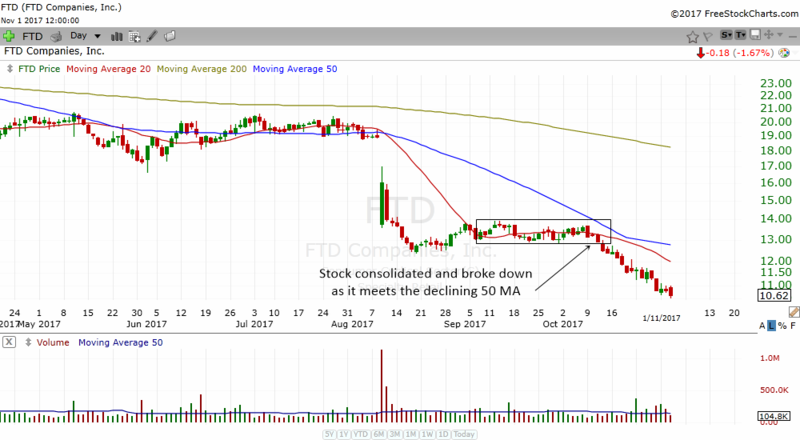 The stock will usually be in a downtrend and when you see this pattern develop, it often warns us that the stock may go down even more in the near future. Therefore, this chart pattern or trading strategy actually follow the trend. In this case, we ride the downtrend lower and profit from shorting the stock. This chart pattern is quite similar to the Bearish Consolidation At 20 MA Chart Pattern Trading Strategy. You can read about it following the link. The only difference is where the stock consolidates and where it breaks down from. 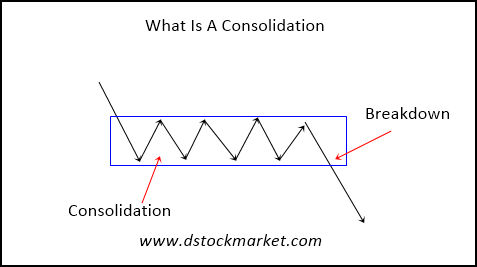 In order to understand this chart pattern or trading strategy, you need to know what is a consolidation. A consolidation is another term for sideways trading. The chart above shows us what a consolidation looks like. A consolidation is a period where the stock trades sideways in a relatively tight manner. It should not be too wide or whippy. Eventually, the stock will breakout or breakdown from the consolidation. The bias for the direction will be with the preceding trend. So, if the stock was in a downtrend and consolidates, the bias will be for the stock to breakdown and continue to move lower. When you see a stock exhibiting these criteria it tells us that it is a weak stock. The consolidation is just a rest before it declines more. 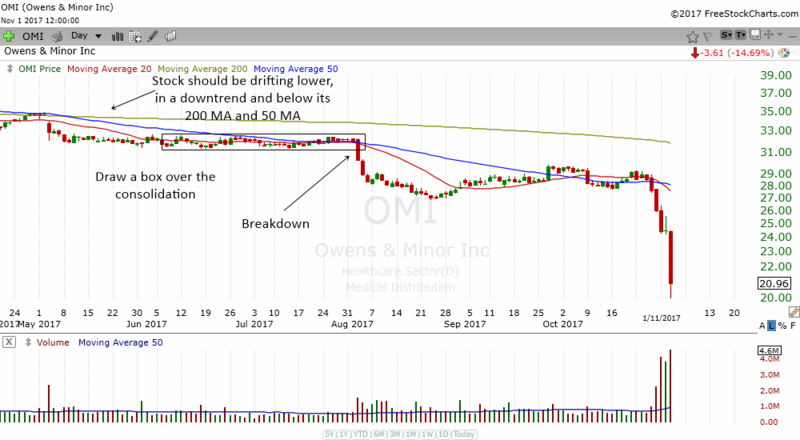 In the chart above, OMI was already drifting lower. It was also below its 200 MA and 50 MA and thus it was in a bearish situation. The stock then consolidated for quite some time. You can draw a box over the consolidation and the moment the stock breaks below the box, it is considered to have broken down. Notice how OMI quickly went lower after the breakdown. In the coming months, the stock fell as low as $20.96. As you can see, this chart pattern is actually a trend following trading strategy. We first find a stock that is in a downtrend or drifting lower. Once we see weakness in the stock, we follow the downtrend and ride it lower. Trend following strategies can often give us a very good risk reward trade. 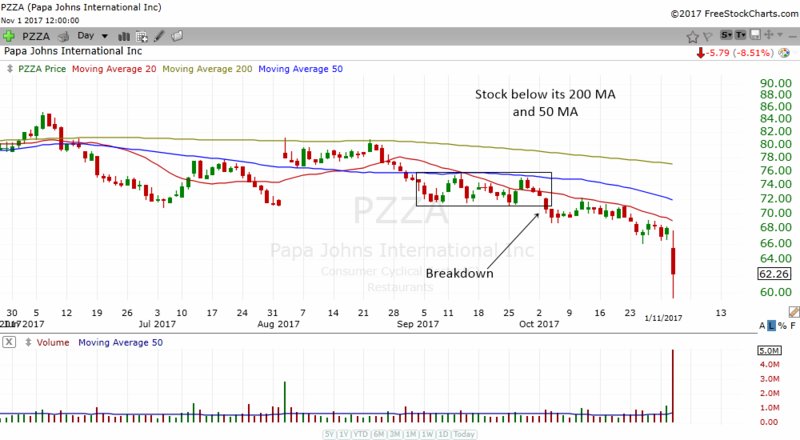 In the chart above, PZZA was already drifting lower. Notice how the stock was already below its 200 MA and 50 MA. This told us that the stock was very weak and the trend for this stock is down. PZZA eventually consolidated for a period of time and the trader can actually draw a box over the consolidation area. The stock broke down below the consolidation and then proceeded to move lower. So how do you trade this trading strategy? You must first identify a stock that fits the criteria. After that, all you need to do is to draw a box over the consolidation and wait for a breakdown. You short the stock when it breaks below the consolidation box. You can short the stock when it trades 0.10 or 0.20 below the low of the consolidation box. Similarly you can place the stop loss slightly above the highs of the box. Perhaps 0.10 or 0.20 above the consolidation. That way you can avoid whipsaws and false breakdowns. 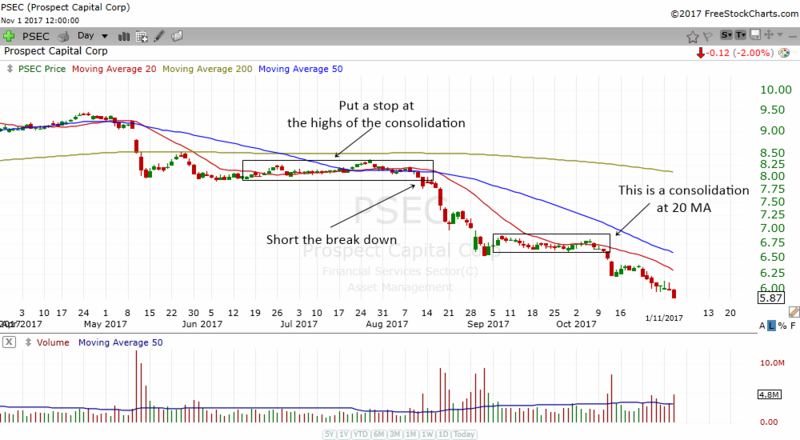 The chart above shows PSEG forming a bearish consolidation at 50 MA. Why do stocks trade sideways for such a long time before breaking down? Well, I'm not sure either. Perhaps the public is waiting for more news about the company and they do not want to make hasty decisions. But eventually a stock that is not healthy will continue to go lower. You can draw a box over the period of consolidation in PSEG. Short the stock the moment it breaks below the box and put a stop loss at the highs of the box. Sometimes its good to see heavier volume as it breaks down. You won't be able to see it on the exact day because the pattern is still forming. But after you enter the short position and see heavy volume, that is a good sign that the stock is bearish and will head lower. Notice how PSEG had some volume spike as it moved lower? By the way, after falling for some time, the stock consolidated once again. This time, it is a Bearish Consolidation At 20 MA. If you learn about this chart pattern and trading strategy, you will also be able to benefit from it by shorting the pattern. Notice how the stock continue to fall. From around $8.00, the stock fell to $5.87. If you took this trend trading strategy trade, you would have made quite a handsome profit. Okay, how do you take profits when your trade is profitable? You certainly don't want to be waiting and waiting. However, I advise you to be a bit slow in taking profits when you are utilizing a trend following trading strategy. Because the trend is your friend, the stock tends to go lower and lower. If you simply take profits too early, you might miss out on a big piece of the profits. Be wise when you are utilizing a trend following trading strategy. If you risked $5000 on the trade and you are making $10,000, always remember to change your stop loss to breakeven. The breakeven is your entry price. That way you will have a free trade. You can also consider selling 1/3 or 1/2 and ride the other positions lower. That way you will book some profits and psychologically it is very helpful. The trend is your friend as they say. Now you have learned a trend following trading strategy. Below are some more examples of this trading strategy. Study them well and I hope that in the future you will be able to spot them. Congratulations on learning another trading strategy. If you want to know more trading strategies do visit the Trading Strategies section. The more trading strategies that you learn the better you will be able to spot trading opportunities. Learn and master a few and you will be able to pull money out of the markets consistently.